For manufacturing/industrial applications, FLUID FILM is used in such harsh environments as pulp mills, salt, fertilizer and battery industrial plants. It also helps preserve and protect parts during shipping or storage. FLUID FILM is used by such major manufacturers as Caterpillar and John Deere to protect key equipment worth millions of dollars from oxidation. Because FLUID FILM is a non-toxic/non-hazardous product, it helps to eliminate the use of hazardous chemicals in a closed environment. FLUID FILM performs for sustained periods of time, clinging tenaciously to metal surfaces, stopping or preventing corrosion and providing silky slick lubrication. FLUID FILM inhibits flash rust, obstructs atmospheric corrosion and lubricates everything from hydraulic cylinders to pneumatic tools. FLUID FILM protects parts in storage for up to 36 months indoors. Out in the full elements, up to a full season of protection allows for shipping of parts overseas and open-air transportation. Safe for most paints and plastics, FLUID FILM offers ease of application and a cost-effective solution to equipment corrosion. Metal shelves and metal storage buildings no longer rust away no matter how much humidity, direct water, corrosive chemical spills, etc., attack them…. FLUID FILM will coat and protect the metal from further damage from rust. FLUID FILM penetrates to the inside of the chain, preventing wear and providing extended lubrication. Displacing any trapped water, it leaves a barrier of protection with sufficient body to resist fly off and water wash off. In dusty environments, FLUID FILM resists dirt buildup due to its slick, non-tacky consistency. FLUID FILM holds up under a wide degree of temperatures, resists high moisture and, because it won’t freeze, prevents chain jam ups due to water frozen in chain links. FLUID FILM was documented as having extended life in locomotive drive chains in salt harvesting machinery by up to 300%. We switched to Fluid Film Lubrication on all our race cars for the 2010 season. Even though we race at one of the sandiest tracks in the country, since switching to Fluid Film, our chains and bearings stay smooth and free, but even more important, free from sand and dirt build. Scott Freitas, Crew Chief/Handler Patriot Motorsports. FLUID FILM protects electrical connections and battery terminals for extended periods of time. FLUID FILM is non-conductive and can be used as a dielectric grease. Fluid Film is just a great product. We are an IT and electronics company that has been using Fluid Film in our repair facility for almost 30 years. We use it for lubricating the mechanical parts inside of CD/DVD drives, inkjet printers, laser printers, computers and audio/visual gear. It stays put while protecting and lubricating. Nothing we have tried comes close to how well Fluid Film works. Many of the workstations we support are used in manufacturing plants and are subjected to less than ideal conditions. After making all of the connections to the workstation, we put a coating on the external parts of the connectors. It stops all of the corrosion and prevents call backs from bad connections. Of course we use it everywhere around the office and our homes for 1001 uses. It is just a great product. 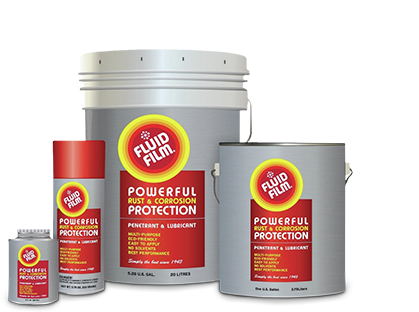 FLUID FILM provides slick, lasting lubrication that could last up to 36 months. It also keeps locks from freezing, even in sub-zero temperatures. A small amount is all that is needed to keep locks buttery smooth. Great for fixing problem locks. I had a deadbolt lock which would not retract and after taking the outer covers off, I still couldn’t get it to slide back. I went and got my hammer and a chisel, but then figured I’d try FLUID FILM first. I sprayed the inner mechanism, let it sit a few minutes, and tried it. Darn if it didn’t work. I extracted the bolt, soaked it real good and reinstalled it, works perfectly. Before FLUID FILM, I would have just bought a new lock because liquid graphite doesn’t work for long, same with wd 40 and the other petroleum based lubricants. Given FLUID FILM’S staying power, I doubt I’ll have to buy a new lock anytime soon. That one use paid for the can of FLUID FILM. Thanks guys!